I was living in Washington, DC, in the eras of 9/11, the start of both recent US wars on/of terror, the Beltway sniper and the now fabled anthrax attacks. One day my friend Andrew J. and I went to see a movie. At the start of the movie was the now common US Marines recruiting ad. I looked over to Andrew and saw that he was visibly saddened. A weird thing has begun to happen in the last few months, particularly in the last few weeks –or maybe I’ve been to blind to notice it before: the ever-growing intimate relationship between MMA –the UFC, in particular– and the US military. This relationship, sadly, may somewhat invalidate my quote above. At least one entire UFC pay-per-view (PPV) event was completely sponsored by the US military and was put on specifically for US military personnel. At last month’s finale of The Ultimate Fighter, UFC’s reality show, it was announced that one of the competitors was leaving for Afghanistan in a few days. The fight commentator, Mike Goldberg, was almost in tears, emoting on how this young man was fighting in the octagon, but would soon be abroad “to fight for our freedoms”. At UFC 107, which I finished watching last night, it was announced in the ring that one of the fights (that between Kenny Florian and Clay Guida) was being “brought to us” by the US Marine Corps. Both fighters then gave the corps a standing ovation, and the camera panned to shaven-head men in uniform in the audience, whooping it up. In the past, UFC has sent its fighters to tour US soldiers in the field, such as Rampage Jackson’s trip to Camp Pendleton. The relationship between UFC and the US military is an increasingly intimate one. Well, what’s the big deal? Ordinarily there wouldn’t be one. In my world, any legal entity is allowed to sponsor any legal event and reap the rewards of sponsorship. And it’s certainly any citizen’s right to express his patriotism in any legal way he sees as appropriate. I may not like the recruitment methods of the US military, and I certainly don’t like the way in which armed men have begun to be revered in some parts of society; but I do not deny the military’s right to sponsor events and the UFC’s right to accept such sponsorship. And, as I’m sure has occurred to many, there is a certain congruence in two brands of violence finding love in one another’s tattooed arms. Admittedly, it makes me uncomfortable that an erstwhile global brand like the UFC is visibly tying its philosophies, fortunes and values to the political dynamic of a single nation, the USA. I wonder what that says of the company’s attitude toward fighters from nations not sharing American geopolitical ideologies. The company’s newsworthy inability (or unwillingness) to sign Russian heavyweight Fedor Emelianenko, considered by many to be the pound-for-pound greatest living fighter in the world, might be indicative of an inability to fit competitors from non-NATO nations into their conceptual dynamic. Even so, if UFC wishes to tie its fortunes thusly, as did many professional wrestling companies, I suppose it is their right to do so, however unattractive to me their brand becomes. But let me be absolutely clear and say that this post is not about bashing the military. Not at all. In other posts, I will gleefully offer my criticisms of US (and increasingly Canadian) military fetishism, and of the thinning line between soldierdom and policymaking, and of immoral and politically inappropriate use by government of the instruments of war and security. But no one should take any of this as criticism of the individuals who serve in the military. All of my interactions with members of the latter have always been pleasant and cordial. 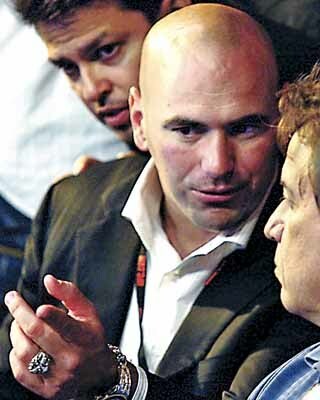 danawhite http://www.tinyurl.com/yd22h4b Read the story then you decide. They have my support. I hope they have you too. I hope it’s clear to anyone reading this that the charges against a detainee (who has yet to face trial, by the way) has no bearing on whether or not his custodians are allowed to strike him. This is the nature of accepting the responsibility of custody. This is how it works in every legal system in the Western world. And as an aside, my congratulations to the US military for convening such a courtmartial; it goes a long way to reclaiming their image as a law-abiding agency worthy of international respect. It’s one thing to accept sponsorship from an arm of the government, on behalf of your company, and to further state your support for the policies and practices of that governmental arm. (After all, that’s what allowing the military to embed itself so closely within your commercial activities means: that you associate yourself with that agency’s policies, practices and philosophies.) It’s quite another thing to brazenly advocate for the preferential slackening of criminal law on select transgressors where such slackening coincides with the larger agenda of your sponsor. In other words, Dana White, private citizen, can do whatever the heck he wants. Dana White, corporate head of UFC, has no business encouraging UFC fans/customers to advocate for the vitiating of selected criminal proceedings…. That is, unless that it is indeed the will of UFC, Inc. I wonder what the UFC Board of Directors has to say about this? And if indeed it is official corporate policy to take a side in this particular matter, then UFC needs to spell this out clearly. And, of course, they will have lost me as a fan, and perhaps many more like me. I’m surprised that no one else has been commenting on the growing intimacy between the UFC (the fastest growing brand in sports) and the US military. A Google search brought me just two hits: this peace activist has a more angry stance than me; and this exchange on a fight forum has already been deleted, only accessible, it seems, through Google cache. The former is par for the course. The latter is simply saddening. What I “expect” is irrelevant. What is important here is what we choose to tolerate. How comfortable are we as a society with our corporate leaders using their corporate heft to influence consumers to not only accede to certain political philosophies (nothing new there) but now to overtly advocate for the vitiation of criminal proceedings in favour of the abuse of an individual? Strange –and critical– times indeed.